I’ve just begun work on a second edition of Beer, Brats, and Baseball: St. Louis Germans. Following the pattern set with Hoosiers and Scrubby Dutch: St. Louis’s South Side, Reedy Press decided against just printing more copies when the last run ran out. Instead, I’ll be adding new stories to the favorites in the first edition. It should be out this summer or early this fall. Also set for a fall release: a coffee table book with the working title Unique Homes of St. Louis. Since last spring, I’ve been traveling the highways and byways hereabouts with photographer Mark Abeln looking for the strangest, oddest, most unusual houses around. My musings on those houses will fill the white spaces that don’t contain a picture. It should be a fun book. I can’t wait for you to read both books. For the workshop, I developed a completely new and more technical 45-minute speech about the material in the book. I worked closely with members of the chapter’s Continuing Education Committee in association with the St. Louis chapters of the Construction Specifications Institute and Building Enclosure Council to make sure this was worthy of continuing education credit recognized by the AIA. The other speaker, Vern Remiger, of REMIGERDESIGN, gave a thorough update of the work of CityArchRiver 2015 to reconnect the river and Arch grounds to the city and prepare the monument for its 50th birthday on October 28. Architect Christopher Ching of Trivers Associates did a stellar job of helping me to prepare for the presentation at the headquarters of the Masonry Institute of St. Louis in Richmond Heights. I never fail to meet people who love the Arch when I do signings and programs about my book, The Making of an Icon: The Dreamers, The Schemers, and The Hard Hats Who Built the Gateway Arch. But architects have a special appreciation of the monument, because they know exactly what Eero Saarinen had to go through to design the monument. It was a real honor to be part of this program. I met a lot of nice people signing books at the once-a-month Creve Coeur Farmers Market Saturday at the Creve Coeur Ice Arena, 11400 Olde Cabin Road. I’ll be at the next one, from 9-noon on Feb. 7. Last year was a year to forget. Don’t you agree? But that’s over, and now we’re in a year to celebrate. 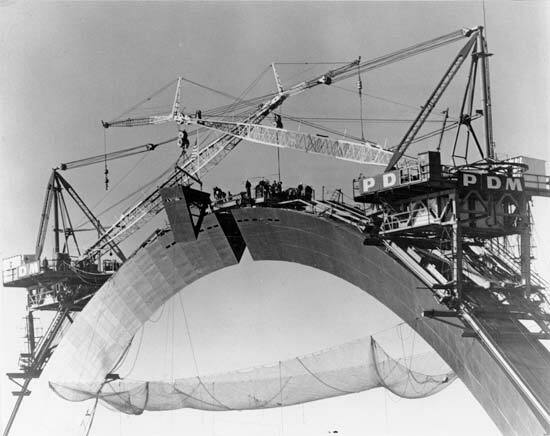 For 2015 marks the fiftieth anniversary of the topping-out of the Gateway Arch. Officially, it happened on October 28, 1965. So we have a while before the actual date. But why wait? The mid-1960s were an incredible time of optimism in St. Louis and the nation. A generation that survived the Great Depression and defeated the Nazis was in charge. We were going to the moon, were about to end segregation, and finally make the world right. The building of the Gateway Arch was the local equivalent of going to the moon. It brought on a sense of celebration not seen since the St. Louis World’s Fair six decades before. Nobody would build it today. The big croquet wicket was too frivolous, too expensive, for us to do it today. Back then, though, downtown workers each day looked out the window to notice the latest progress of construction. Kids like me looked forward to the Sunday afternoon visits to the Arch grounds. 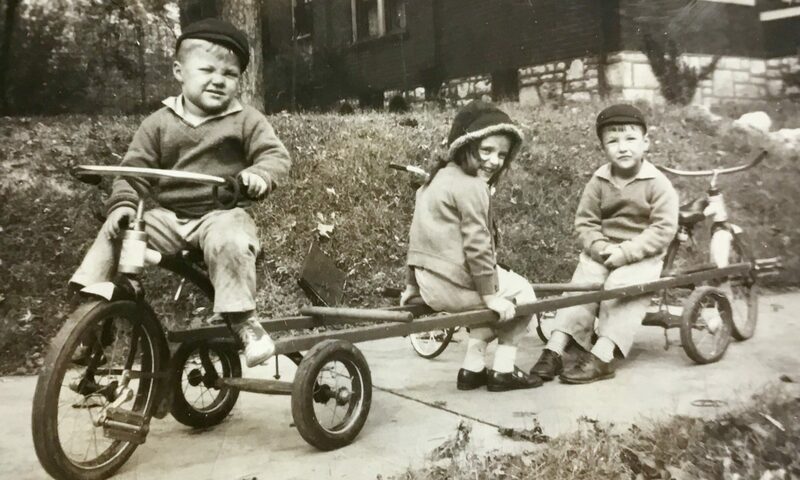 That’s one of the many reasons I loved writing The Making of an Icon: The Dreamers, The Schemers, and the Hard Hats Who Built the Gateway Arch. It brought the town together and have us a hope we’ve lost. Last year gave us plenty of reasons for St. Louisans to lose hope. But it’s a new year and time to reflect on what we once did. It shows us we can do great things. On the fiftieth anniversary of the completion of the Gateway Arch, we again have reason to hope and celebrate.